Pure-blooded Angel and sister of Isabel, the Angel of War. The only Angel who was granted the possession of two Divine Armas: Dawn Sword and Dusk Shield and a former candidate of the Nine Divine. 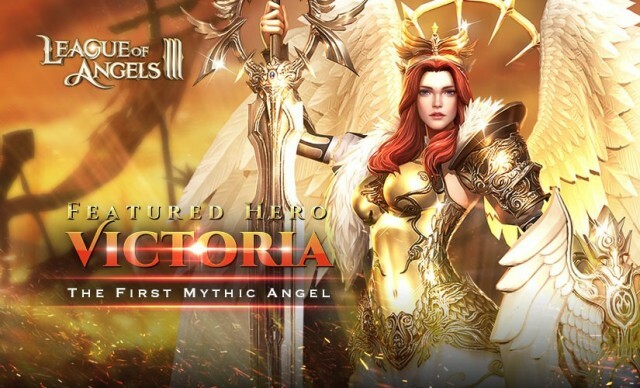 Victoria is the first Mythic hero in League of Angels III. The Angel of Victory was chosen to receive the title "Glory". With her two Divine Armas in hand, she resolved to do everything she could to protect the Angels and Sapphire. And Victoria herself was sure - the Angels would win the war in the end. Victoria will be available from Feb 11st to Feb 14th in the operation event “Featured Hero”, please seize the chance to obtain the first Mythic Hero! Uses the Dawn Sword's power to attack a column of enemies, dealing (ATK * 157% +70) damage. Has a 25% chance to taunt them. With the support of the Dusk Shield, Max HP *10%+1000 HP will be restored at the end of every round. Condenses the power of the Dawn Sword and the Dusk Shield and attacks all enemies, dealing (ATK * 110%+100) damage. Has a 25% chance to taunt them. (If target already has Taunt, its duration will be extended by 1 round). This chance is increased by an additional 10% against enemies with lower HP than self. At the same time, Block is increased by 30% for self. Lasts 2 rounds. After casting, Victoria's Damage Reduction is increased by an additional 50% for 1 round. After casting, Victoria's Damage Reduction is increased by an additional 50% for 1 round. Guaranteed to taunt 1 front row unit. When taunted by Victoria, enemies ‘ultimate skill cannot be released and only normal skills are available. In addition, their attacks are locked to Victoria. 5. Drawing 5 times will guarantee Theme Hero Shards, i.e. Victoria shards. 1. Accumulate required recharge amount during event time to claim a series of great rewards, such as Hero Shards, Hero Resource Coupons and other essential materials. Note: you can get more Victoria Shards via the same recharge amount than before. 2. Recruit more than 20 times can obtain more Victoria Shards compared to the last featured hero event. The first Mythic Hero Victoria is available in the event "Featured Hero" from Feb 11st to Feb 14th. Don’t miss the chance to get Angel of Victory – Victoria!